Plush Velvet Jewelry Pouches, 2.75" x 3"
Velvet Bags, Black, 2" x 2"
Plush Velvet Jewelry Pouches, 3" x 4"
Plush Velvet Jewelry Pouches, 1.75" x 2"
Plush Velvet Jewelry Pouches, 4" x 5"
Velvet Bags, Black, 4" x 5"
Velvet Bags, Hunter Green, 2" x 2"
White Leatherette Jewelry Pouches, 3.5" x 4.75"
Velvet Bags, Black, 3" x 4"
Velvet Bags, Red, 3" x 4"
Velvet Bags, Navy, 2" x 2"
Velvet Bags, Black, 3" x 3"
Velvet Bags, Red, 4" x 5"
Velvet Bags, Navy, 4" x 5"
Velvet Bags, Burgundy, 3" x 3"
Velvet Bags, Burgundy, 2" x 2"
Velvet Bags, Hunter Green, 3" x 3"
Velvet Bags, Grey, 4" x 5"
Velvet Bags, Navy, 3" x 4"
Velvet Bags, Burgundy, 3" x 4"
Velvet Bags, Red, 2" x 2"
Velvet Bags, Grey, 2" x 2"
Velvet Bags, Royal Blue, 2" x 2"
Velvet Bags, Hunter Green, 4" x 5"
Velvet Bags, Red, 3" x 3"
Velvet Bags, Navy, 3" x 3"
Velvet Bags, Burgundy, 4" x 5"
Velvet Bags, Grey, 3" x 3"
Velvet Bags, Royal Blue, 3" x 3"
Velvet Bags, Hunter Green, 3" x 4"
American Retail Supply velvet bags are made of specially selected, high quality, luxurious velvet that has a small amount of stretch. Velvet bags are closed with ribbon pulls. Use these Velvet Bags for wedding favors, retail packaging, jewelry bags, home crafts, handmade soaps, party favors, wine bags, and sachets. 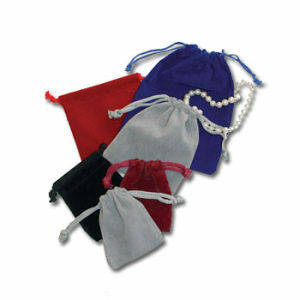 Velvet bags are ideal for gift shops, jewelry stores and beauty salons. There are two different types of velvet bags. The plush velvet bags are thick, soft, cotton lined, clean stitching and are high quality. The velvet bags are thin, soft and polyester lined. We also have leather poches. These are smooth, thick, high quality bags. If you don’t see exactly what you need, call us at American Retail Supply 1-800-426-5708 to speak with one of our product experts.